What do the ornaments on the Chrismon-Kids Tree mean? Known as The Fruit of the Spirit Star. Each of the points represent one of the attributes of the fruit of the Spirit. "The Fruit of the Spirit is love, joy, peace, patience, kindness, goodness, faithfulness, gentleness, and self-control" Galatians 5:22-23. The universal symbol of love. "For God so loved the world that he gave his only Son, that whoever believes in him should not perish but have everlasting life" John 3:16. "...God is Love" 1 John 4:16. The ever present reminder of the price that Jesus paid for our sins. Jesus paid the debt that we owe to the Father. He in turn gives us the free gift of new life. "The wages of sin is death, but the gift of God is eternal life in Christ Jesus our Lord" Romans 6:23. The Latin Cross is shown here and is the most widely used cross design. "Let us fix our eyes on Jesus, the author and perfecter of our faith, who for the joy set before him endured the cross..." Hebrews 12:2. God's Messenger. "Are not all angels ministering spirits sent to serve those who will inherit salvation?" Hebrews 1:14. Traditionally the dove represents peace, and is a symbol of the Holy Spirit. "...the Holy Spirit, whom the Father will send in my name, will teach you all things and will remind you of everything I have said to you. Peace I leave with you; my peace I give you" John 14:26-27. ICHTHUS is the Greek acrostic for, Jesus Christ Son of God, Savior, and was also the Greek word for fish. Persecuted Christians of the early church used the fish symbol as a secret sign to identify one another. A person would draw half the fish in the sand, and another would complete the drawing to identify him or herself as a fellow believer. "'Come, follow me,' Jesus said, 'and I will make you fishers of men'" At once they left their nets and followed him" Matthew 4:19-20. The crown represents the majesty and royalty of Christ. God is the sovereign ruler of the universe. This crown is composed of three triangles representing the Trinity. The three circles represent the eternal nature of the Trinity. "...They lay their crowns before the throne and say: 'You are worthy, our Lord and God, to receive glory and honor and power'" Revelation 4:10. 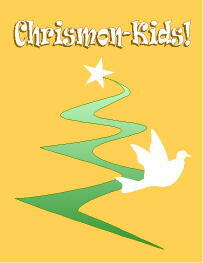 Back to the Chrismon-Kids tree.